Strange, puny little convective tower down toward University yesterday afternoon. The 7-day series of GPS PW from on campus (below) shows we were up to around 30 mm yesterday, but have since crashed back down to about 15 mm. Considerable thunderstorm activity yesterday over most of Cochise County (above shows detected CG flashes thru midnight last night - from Atmo and Vaisala). The composite radar display below is from a bit after 2:00 pm MST (note the severe thunderstorm warning in effect south of Wilcox). It was a difficult day for the various forecast models: the 06 UTC WRF-GFS kept the storms across border in New Mexico; the 12 UTC WRF-NAM was similar; but 12 UTC WRF-GFS forecast afternoon storms in northeast part of Cochise County; and then the 18 UTC WRF-NAM caught up with the real world (above is that model's forecast valid at 3:00 pm). But, by the time forecasts were available from that model run, thunderstorms were already occurring. A plot of 24-hour precipitation thru 7:00 am this morning (below, from MesoWest) shows that rain amounts at stations were once again quite light - but the Rucker Canyon RAWS measured 1.48 inches during a storm that also produced gusts to 40 mph, and the Headquarters RAWS site to the north had 0.40 inches. Note the reading at Patagonia is obviously from a station that is having serious problems. Of interest is that a severe thunderstorm impacted the windy Guthrie RAWS site - there was a wind shift to the south there with gusts to 64 mph between 6:00 and 7:00 pm - radar indicated storms in that area at that time. Finally, down at bottom is the GEFS average 500 mb heights forecast from 00 UTC last evening - valid time is 00 UTC on July 7th. The strength of the large anticyclone that covers the western 2/3 of the of the CONUS is almost frightening. The orientation of the forecast high would tend to block low-level moisture into Arizona from the East Pacific, although some increased PW could work into parts of Arizona from the east. The Fourth Holiday here will be hot and dry, and then we'll be watching the detailed structures within that monster 500 mb high. First - a look at yesterday. Photo above was taken looking southeast from here right before sunset. There were two, stubby little Cbs off in the distance - radar says they were over the north end of the Santa Ritas. Below is the SPC map of severe thunderstorm reports yesterday. A big storm day from northern Plains all the way to the Gulf Coast with almost 700 reports. Two long-lived MCSs produced severe winds from eastern Nebraska to the Gulf (over 600 severe wind reports yesterday)! 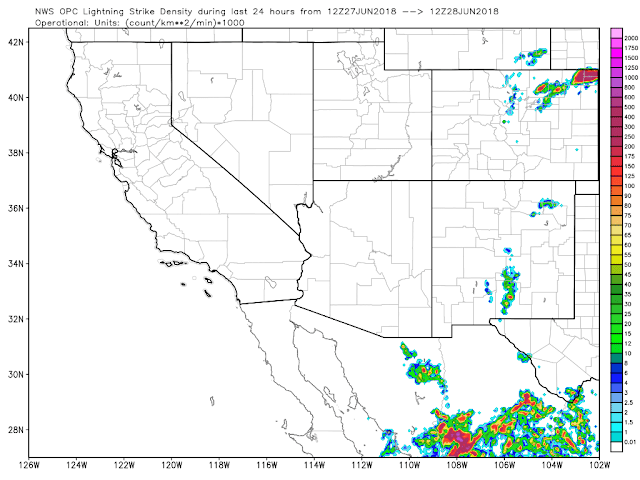 Thunderstorms in Arizona focused on southwest Cochise County with abundant CG flashes (above is 24-hour detected CG flashes thru 1:00 am MST last night, from Atmo and Vaisala). The map below (from MesoWest for 24-hour rainfall ending at 7:00 am this morning) is zoomed on the lightning region - a couple of reports over 2/10s of an inch, but mostly sparse rainfall and wildfire threat. Now - this morning's situation. 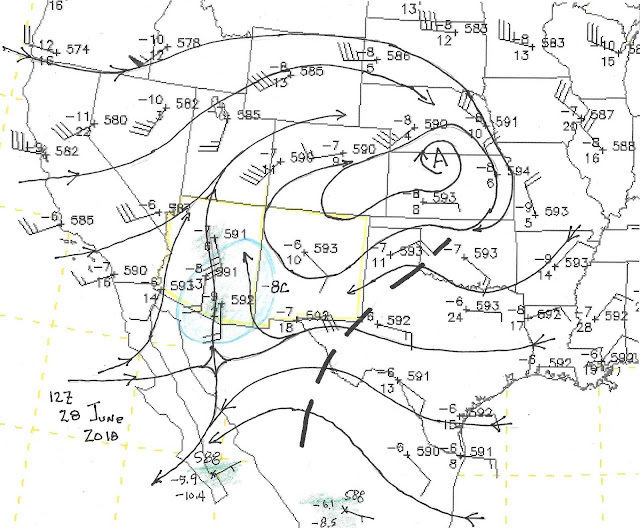 The 500 mb analysis for 12 UTC (above from SPC) shows that the California trough is pushing eastward across Arizona and is a more dominant feature than the models forecast a couple of days ago. The morning skew-T plot of data from TWC (below) shows PW of 1.26" and substantial CAPE - both somewhat surprising (although the jump in PW had been predicted by the GEFS earlier this week), however those forecasts kept the PW high through the Fourth of July here. The forecast issue for the day is now - will deep convection develop nearby? The forecast models have gone completely dry - the 06 UTC WRF-GFS basically forecasts no rain in Arizona through the Fourth. Here are two PW forecasts from the 06 UTC WRF-GFS. The forecast above was valid at 5:00 am (TWC sounding time). It appears that the forecast was too dry by about 2/10s of an inch this morning - a significant amount. However, the forecasts move drier air in steadily during the day from the west and forecast below is valid at 6:00 pm this afternoon - an ugly forecast, especially compared to those earlier in week that kept PW high. So in summary - the morning sounding is very unstable but forecast to change rapidly during the day as warmer and drier air advects in between 700 to 300 mb. The models forecast that this trend will kill storm development in Arizona. However, I tend to feel that we'll at least be able to see storms around this afternoon - especially to east and southeast, even if they aren't hitting here in the metro. A tough and disappointing situation for today. This morning dewpoints have increased into the 50s F from Tucson southeastward - helped by mountain thunderstorms over northeast Sonora. Increases were gradual, except at Douglas where there appeared to be an outflow passage around 6:00 am MST. The CG flash density maps (24-hours ending at 12 UTC this morning - from weather.graphics and Vaisala) for the Southwest (above) and Mexico (below) show that Mexico was VERY active yesterday south of 28 degrees north. The Southwest was totally suppressed west of the Continental Divide. Since the height analysis at 500 mb is not very enlightening, I took time out this morning to do a streamline analysis for that level. Results are above. 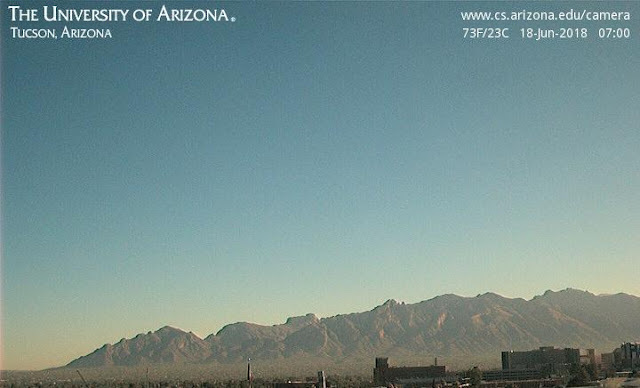 the anticyclone has shifted off to the northeast, while Arizona remains between the California trough and the west part of the anticyclone. A weak, inverted trough extends from northern Mexico up into Oklahoma. There is a pocket of temperatures around and slightly colder than -8 C over much of Arizona. The extent of moist air (green) at 500 mb is uncertain because of the huge observational data void of northwest Mexico - but the IR image below (14 UTC) indicates that the moist air at 500 mb probably extends from south end of GoC northward across much of Arizona. Tropical storm Emilia is far southwest of the end of Baja and is forecast to move away toward the west-northwest. Even though PW increases, the 06 UTC run of the WRF-GFS forecasts little rainfall (second below) over Arizona (except for places in Cochise County) through noon on the first of July - probably due to intruding westerlies from California and warming in mid-levels. The 500 mb analysis this morning (above from SPC) indicates an anticyclone is over northeast New Mexico, with a band of 20 to 25 kt east winds from El Paso to Tucson, along with quite cool temperatures in mid-levels. 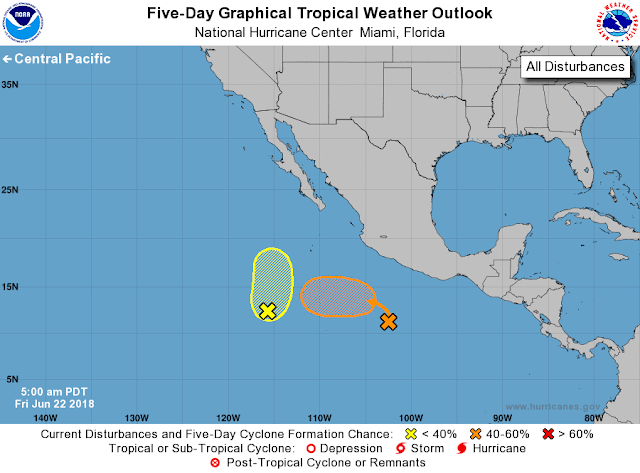 The pattern is a bit chaotic with a weak trough inching across southern California and an inverted trough far to the south over west-central Mexico. 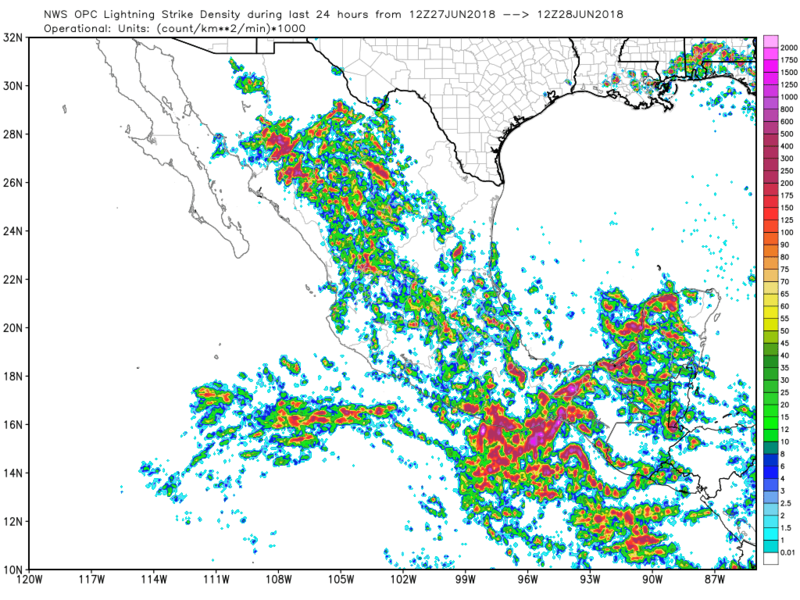 The inverted trough will likely help increase thunderstorms over northwest mexico and also play a role in the large increase in PW forecast by the models - this begins today and continues through Friday night. See the 00 UTC GEFS plumes for PW at TUS below. By Saturday the PW here is forecast to reach to around 30 mm (1.2 inches) and hold steady through rest of forecast period. The same forecast for QPF at airport (second below) indicates periods of light showers, and probably thunderstorms, from Friday evening (the 29th) through the Fourth of July. A forecast skew-T for TWC (above from 06 UTC WRF-GFS at Atmo) valid at 5:00 pm MST on Friday shows an interesting sounding with west-northwesterly winds through the well-mixed boundary layer and southwesterly winds above (due to the slight eastward progress of trough over California). The forecast mixed-layer CAP is just over 800 J/Kg due to increased BL moisture and cool mid-level temperatures continuing to hold off much warmer air out to the west. Forecasts here are from the 00 UTC operational GFS and are also valid at 5:00 pm on Friday - above is 850 mb and below is 500 mb. The flow at 850 brings higher PW from GoC anticyclonically into southeastern Arizona (a situation that occurs frequently during summer). The 500 mb is chopped-up but is open to low-latitudes, which allows the push of low-level moisture into Arizona. All-in-all, it appears that we'll have interesting weather to watch as June draws to a close. A slow-moving 500 mb trough moves into the West by the weekend - above is GEFS average 500 mb forecast (from 00 UTC last evening) for 12 UTC on 30 June (Saturday). This opens up the Southwest to flow from low-latitudes and allows higher PW to return. 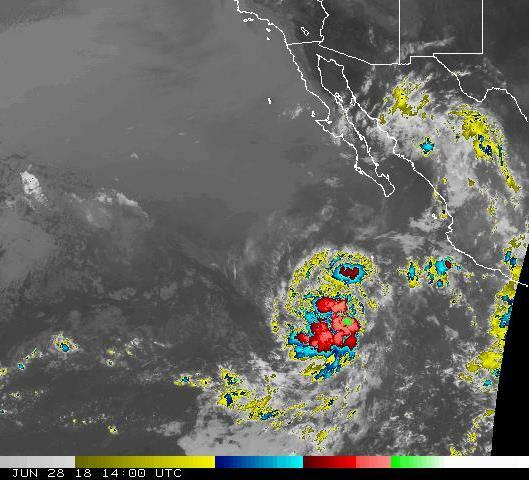 The return of moisture will be helped by outflows from convective systems over northern Mexico. The forecast below of PW is from the 06 UTC run of the WRF-GFS at Atmo and is valid at 6:00 am MST on Saturday. The model forecasts a distinct Gulf Surge at that time. The 00 UTC run of the WRF-GFS (on 5.4 km grid) forecast of total precipitation through 5:00 pm on July 3rd is below. Most rainfall is forecast for high elevations, indicating an increased threat for dry lightning over many lower-elevation parts of southeast Arizona. At the same time as all of this, the Eastern Pacific tropics continue to be quite active - second below is five-day outlook from NHC this morning. , capturing the pronounced shift to hostile westerly winds above 700 mb. Walk this am was definitely toasty and muggy - quite a change! Should have been paying more attention yesterday. At 6:30 am MST it was 82 here at house and when I checked, dewpoints were in the 60s F from Tucson to Puerto Penasco to Yuma. The TWC 12 UTC skew-T plot above shows that moisture increased (during past 24-hours), reaching an inch this morning. Southerly winds below 700 mb have produced the increase in low-level moisture. The 1330 UTC visible image (above) indicates some cloudiness over the Mexican mountains, while the 12-hour plot of CG flashes below (ending at 06 UTC, from Atmo and Vaisala) indicates all thunderstorm activity was far removed from our Borderlands - so convective outflows not at play in our moisture increase. Forecast question for today is whether or not there will be some high-level buildups over the Sky Islands this afternoon. 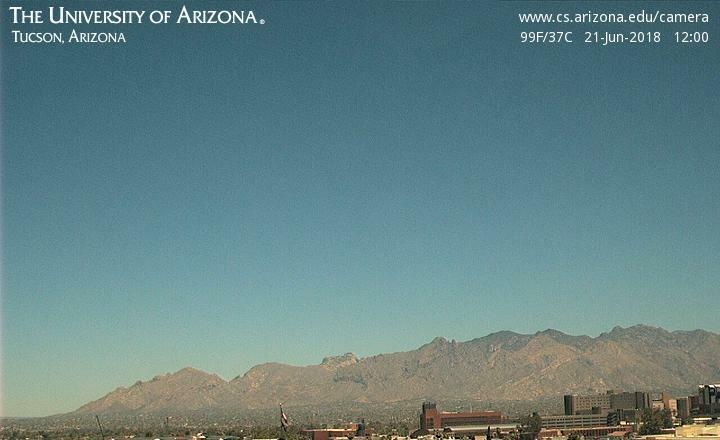 Series of web cam views of Catalinas for past week (bottom three images) have not seen a cloud of any type since last Sunday! 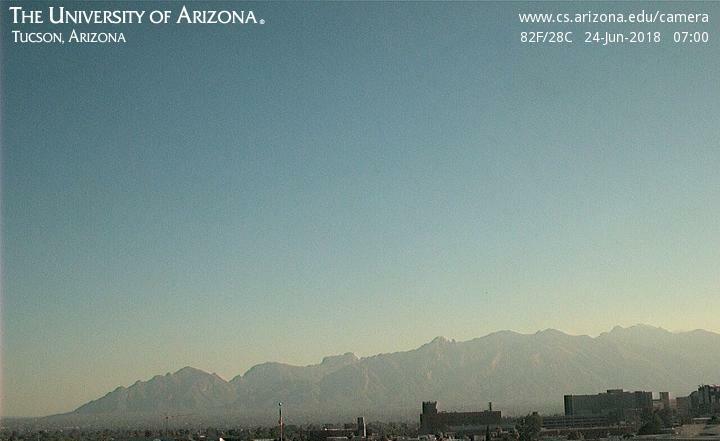 But the haze due to the moisture increase is clear this morning. 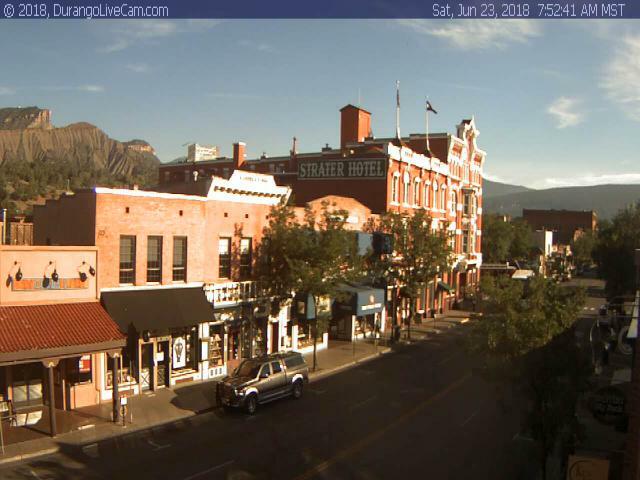 Cooler and greener locale to our north-northeast - sunrise at Durango, Colorado, with the Historic Strater Hotel dominating image. The synoptic pattern continues to favor strong thunderstorms and heavy rains over much of central and eastern U.S., while keeping things terribly suppressed here in Southwest. Above plot shows detected CGs across CONUS for 12-hours ending at 12 UTC this morning - certainly an active night (from Atmo and Vaisala). Forecast below is from 00 UTC WRF-GFS forecast run at Atmo and shows total precipitation forecast through 5:00 pm MST on June 30th - I didn't feel there was need to show the color scale, since black is black is zero. Finally photo below is of a metal sculpture of a bat family bicycling along the Loop trail at the Campbell Ave. bridge over the Rillito. The bridge is the summer home for thousands of Mexican free tail bats, which swarm out in the late evenings to feed during the nighttime. The rains of last Friday and Saturday quickly gave way to typical hot and dry June weather. The high temperatures from Sunday through yesterday at airport ran: 93, 99, 99, 102, and 106 F. The grounds over in the park by the Rillito seem as dry and dusty as they were before the rains. The 500 mb analysis above is from the 00 UTC run of the operational GFS model. The subtropical ridge stretches across Florida, westward along our Borderlands, and on to the west north of Hawaii. We remain under the dry flow around the east Pacific lobe of the high, and tropical disturbances are blocked far to our south by the ridge. The subsidence with this anticyclone has been keeping our skies deathly clear - below is visible image centered on Arizona at 6:00 am MST this morning. 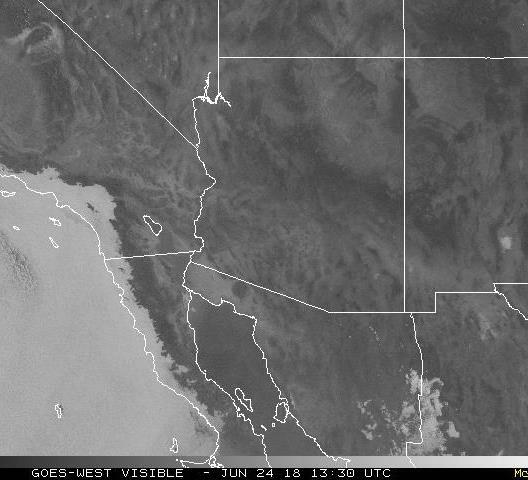 The "June gloom" under the oceanic stratus over at San Diego would be welcome break for us desert dwellers. The GEFS forecasts (mean of the ensemble members for 00 UTC on 27 June above and 12 UTC on 30 June below) for 500 mb continue the blocking ridge overhead through much of next week. However, by the end of the month the models forecast a Pacific trough that breaks the ridge and opens to lower latitudes to our west (below), which is certainly what I'd like to see happen. The NHC 5-day outlook at bottom indicates the possibility of tropical storm activity west of Mexico by the time the break in ridge occurs. These forecasts are for a very-long time range, but the trend is good, compared to what we're currently observing. 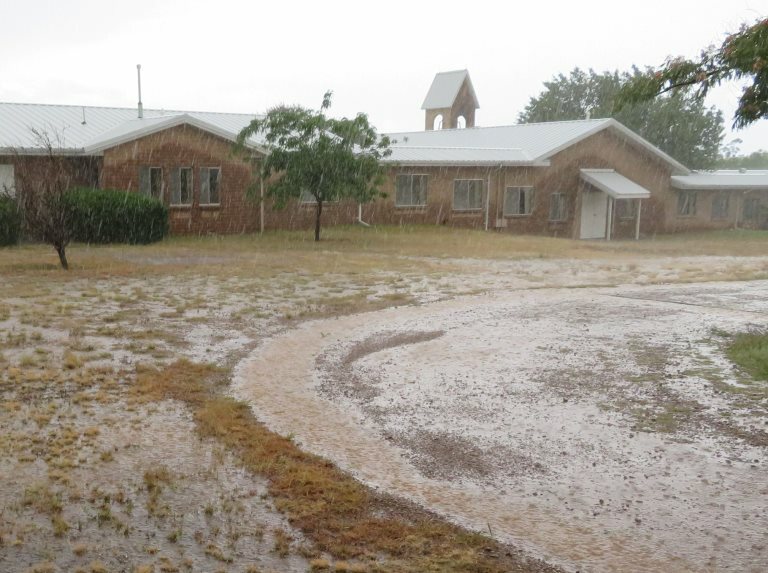 Sister Pam at Santa Rita Abbey sent this photo, which was taken Saturday afternoon (June 16th) during a heavy thunderstorm at the Abbey. She reports 2.00 inches of rain from Friday mid-day through Saturday evening. The heavy thunderstorm dumped 1.40 inches of rain during a short period Saturday. Today is the summer solstice for the northern hemisphere and will be our longest day of the year - shorter days begin immediately but temperatures continue nasty hot. 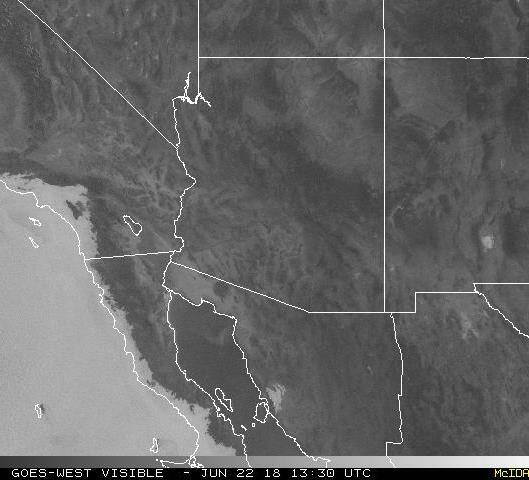 The Pacific lobe of the sub-tropical high now dominates the Southwest with very hot and dry conditions this morning. The 500 mb analysis for 12 UTC this morning (above from SPC) shows very warm (hot) temperatures over all the Southwest of -2 to -3 C, which is very nasty. The morning TWC plot below shows the warm air and only about 10 mm of PW. MIMIC total precipitable water analysis (TPW - above for 12 UTC this morning) shows the dry conditions over the Southwest and northern Mexico. There is a small region with high PW pushed far south - from end of Baja down to Cabo Corrientes. Detected CG flashes (below, from Atmo and Vaisala) for 12-hours ending at 06 UTC last night (20 June) reflect this sorry state of affairs. Down at bottom is the operational GFS forecast of total precipitation for the period ending at 06 UTC on the last day of June. Situation about typical now, with hopes for the real monsoon to begin first week or so of July - but the short-lived burst was a great relief from the heat and drought that prevailed since February; now just a sweet memory. Great Precip Event For Mid-June!